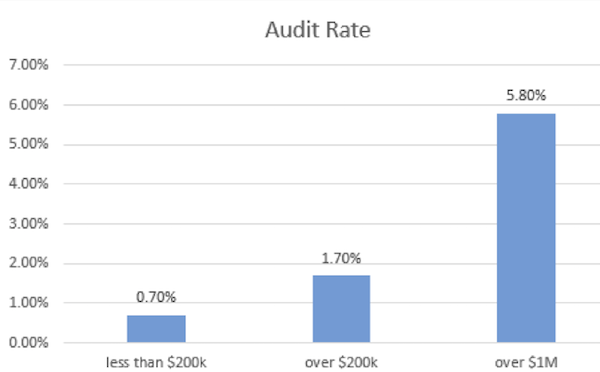 Should You Be Worried About a Tax Audit This Year? We spend a lot of time talking about income taxes. No, we’re not masochists, we just know that for most people, and especially for retired folks, income tax planning is one of the best ways to keep more of your money. Consistent and thoughtful income tax planning done year after year can add hundreds of thousands of dollars to your net worth over time. This means thinking about legal ways to reduce income tax. One of the questions we always get when talking about tax planning opportunities is: “But wait, will this generate an audit?” And while we want to take advantage of all the legal opportunities we have to save money on taxes, we also don’t want to face the fear, anxiety, and hassle that going through a tax audit may cause. First of all, the chance of getting audited is very low from a purely statistical standpoint. The Wall Street Journal reports that in the last year the IRS audited just over one million individual returns, which is only about 0.7% of the returns it received. In addition, the number of audits is getting lower and lower due to a continuing budget crisis at the IRS. Audits were down 16% from the previous year, and the lowest they have been for over 10 years. However, it’s important to note that some folks are more likely to get audited than others. Yes, you guessed it, upper-income taxpayers generally have a much higher chance of getting audited. However, it’s also important to note that these rates are much lower than they used to be. In 2011, before the IRS budget cuts had really taken their full force, about 12.5% of returns with incomes over $1 million were audited. While I might take issue with the Treasury Department’s terminology—by “aggressive tax planning,” I assume they mean illegal tax schemes, which we too would obviously want to avoid—the point is well taken. Higher income folks are, in general, more likely to fall prey to unscrupulous sales tactics for some of these illegal tax shelters, and that’s why working with a fee-only fiduciary financial advisor is so important. To go even further, you should also work closely with ethical tax professionals to make sure you steer far away from the line and to keep the risk of audit as low as possible. Living in the electronic age means the IRS is collecting more data on people than they may realize. By law, financial institutions are typically required to report tax-related activity in your account to the IRS, and therefore, they are able to double-check your return against 1099s and other tax forms provided by the financial institution. Therefore, before you submit your return, double-check to see if the numbers match those on the relevant tax forms. This is one of the easiest ways to stay off the audit radar—simply realize that much of the information that you receive on a W-2, 1099 or other tax forms is also reported directly to the IRS. If you are a W-2 employee, there are strict limits to the amount of legal tax planning available to you. Beyond company benefit programs and the normal set of deductions available to all taxpayers, there is a limit to the choices you can make to lower your tax bill. Small business owners, on the other hand, have more options available. However, because most small business owners do not have company payroll departments calculating and withholding taxes for them on a frequent basis, the IRS has a much more watchful gaze pointed in their direction. This is especially true for unincorporated businesses, who report their income on a Schedule C.
IRS research has shown the largest amounts of noncompliance typically come from returns of taxpayers who own their own businesses, deal in large amounts of cash, receive payments that aren’t subject to tax-withholding requirements and whose income isn’t reported separately to the IRS by third parties. Auditors often zero in on filers of Schedule C, or, “Profit or Loss From Business.” Compliance tends to be much higher when there is withholding, third-party reporting or both. For this and other reasons, we often recommend that small business owners incorporate their businesses. This allows them to take advantage of legal tax planning opportunities while also having taxes withheld from payroll, lowering this IRS audit risk factor. Smart income tax planning plays a key role in maximizing your wealth, and a thoughtful long-term strategy combines the desire to lower taxes with a healthy respect for the law and those who enforce it. Having a personal CFO on your side, one who knows your situation, the relevant tax planning opportunities and is absolutely 100% working on your behalf (i.e. not a salesman) is critical for long-term wealth maximization.